Asset disposal accounts are like miniature profit & loss accounts: they are final accounts, and not going on any further. Once written up, with their one and only set of entries, they are balanced and carried down to show the profit or loss on the asset disposal concerned. The account will then remain untouched until such figure is transferred to the profit and loss account. Profit and Loss account reports all the revenues and expenses of a business at once. In contrast, asset disposal accounts only report particular transactions, in other words the disposal of individual assets. You write up a separate asset disposal account for each asset disposed of, such as a motor van or machine. The idea is not only to record the disposal of the asset, but at the same time to close down the two other accounts which relate to the asset in the books the ‘asset account‘ itself, and the ‘provision for depreciation on asset account‘. It both co-ordinates and combines the closing down of these accounts in the way it follows the double entry principle. Otherwise, recording asset disposals would be a messy business, and mistakes would be easily made. 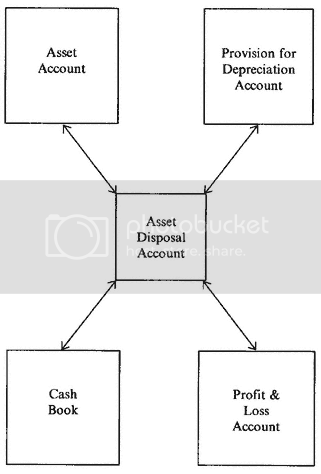 A schematic illustration of asset disposal shown below: The dual postings with the particular asset account, the account for provision for depreciation on that asset and the cash book take place when the asset is sold. The fourth does not take place until the final accounts are compiled. Post the sale proceeds to your asset disposal account, with the counterpart posting to cash, bank, or a personal ledger account if sold on credit. The balance c/d on the asset disposal account will then represent a profit (if credit) or loss (if debit) on sale of asset. In the end, along with all the other revenue and expense account balances, it will go to the trading, profit & loss account. To put this into practice, let’s assume a motor van originally bought for $10,000 and now sold for $3,000. In the next available space in the journal, write the date in the appropriate column, and the word ‘Sundries’ to indicate a combination posting. 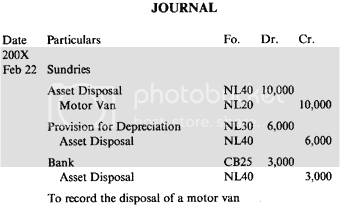 Below that write ‘Asset Disposal [name of asset]’, as in the example below. Enter the original value of the asset, i.e. the value actually recorded in the asset account, in the debit cash column (in the example, $10,000). Beneath your heading, indenting slightly, write the name of the asset concerned: ‘Motor Van’. Enter the same book value ($10,000) in the credit cash column. Beneath your last entry in the particulars column, write: ‘Provision for depreciation on [name of asset]’. In the debit cash column, enter the balance showing on provision for depreciation account, e.g. $6,000. Beneath your last entry in the particulars column, indenting slightly, write the name of the asset disposal account concerned. In the credit cash column, enter the balance of the provision for depreciation account, e.g. $6,000. In the particulars column write ‘Cash’ or ‘Bank’ as appropriate (or the name of a personal account if the van was sold on credit). Enter sales proceeds in the debit cash column (e.g. $3,000). Beneath the last entry in the particulars column, indenting slightly, write the name of the asset disposal account concerned. Enter the value of sales proceeds in the credit cash column, e.g. $3,000. Beneath this set of entries write: ‘To record disposal of [asset concerned]’. Make postings to the ledger following the instructions you have just recorded in the journal. Open new accounts where necessary. Total up and balance the asset account, the provision for depreciation account and the asset disposal account, the last of which will be the only one which may have a balance remaining. Remember, you need a separate asset disposal account for each asset disposed of.